(Newser) – Former French President Nikolas Sarkozy is facing serious corruption allegations, but he not only denies them, he says they cost him the presidency. "This calumny has made my life a living hell since March 11, 2011," he told a French court this week after being placed under formal investigation, per Reuters. Sarkozy's campaign is accused of accepting suitcases full of cash from then-Libyan leader Moammar Gadhafi in 2007 in breach of campaign finance laws. 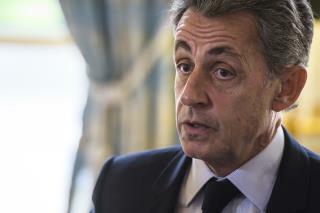 Sarkozy says it never happened and that he is "accused without any physical evidence." He claims that Gadhafi made up the story to discredit him because Sarkozy supported the military effort to overthrow the Libyan dictator in 2011. The most corrupt leader France ever had. The true Gadhafi story may never be heard, but the video evidence shows that he conned Gadhafi into thinking they were on good terms (video of them meeting and exchanging pleasantries), then being the co-orchestrater with H Clinton, of the most heinous overthrows in modern history. Too bad that currency was the reason Gadhafi was overthrown and murdered. Sarkozy, we know the shorter people are, the bigger the lies. You are a HUGE lying son of a trash bin.